MULVANE, Kan. – This was Déjà vu all over again for Scott Snedecor in the opening day of the Clem McSpadden National Finals Steer Roping. For the second-consecutive year, no one won more money than the Fredericksburg, Texas, cowboy in Rounds 1 through 5 at the NFSR. 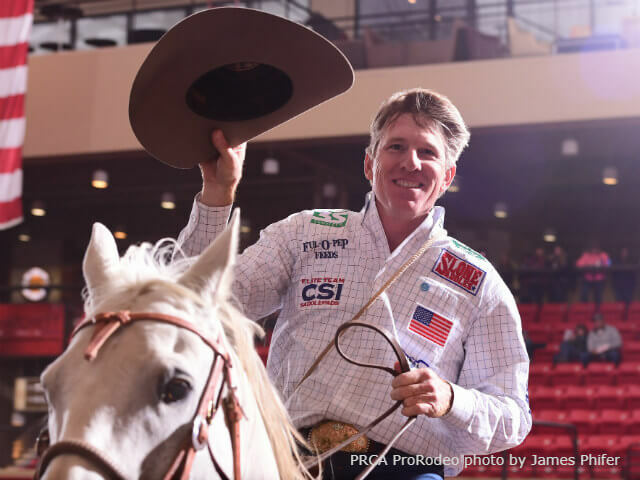 Snedecor, the reigning world champ, won Round 2, split the win in Round 1 and was second in Round 4, earning $25,098, the most of any contestant on Day 1 at the Kansas Star Arena. Those results helped Snedecor move from second to first in the PRCA | RAM World Standings with $95,943. He leads second-place Tuf Cooper by $6,516. Snedecor also won world titles in 2005 and 2008.
Cooper had an amazing regular season, establishing the PRCA record for money earned in a season before the National Finals Steer Roping with $89,427. The previous record was set in 1998 by the legendary Guy Allen with $87,927. However, Cooper had a rough first day Friday, registering a no-time in four of the five rounds. He had a 14.6-second run in Round 2 but didn’t place. Snedecor didn’t waste any time to get rolling, splitting the win in Round 1 with Vin Fisher Jr., as they each had 10.4-second runs. He rode that momentum to a Round 2 victory with a 10.9-second time. In Round 3, Snedecor didn’t place, but he did register a business-like 14.9-second time. He then placed second in Round 4 with a 10.7-second effort. Chet Herren won that round with a 10.4. Round 5 was Snedecor’s only miscue, as he had a no time. Brodie Poppino (10.1 seconds) and Rocky Patterson (11.1 seconds) were the Round 3 and Round 5 winners, respectively. “I will rebound after Round 5 and have fun again (Saturday),” Snedecor said. More importantly for Snedecor is he’s fifth in the average with a 46.9-second time on four head. Cody Lee is first in the average (64.8 seconds on five head), followed by Patterson (72.5 seconds on five) and Bryce Davis (73.2 seconds on five). Lee, Patterson and Davis were the only cowboys to rope five steers. Snedecor was quick to credit his success to Possum, the horse Snedecor won the world championship on last year. Snedecor, who is making his 17th appearance at the NFSR, is keeping the same simple approach as he gets ready for Saturday.